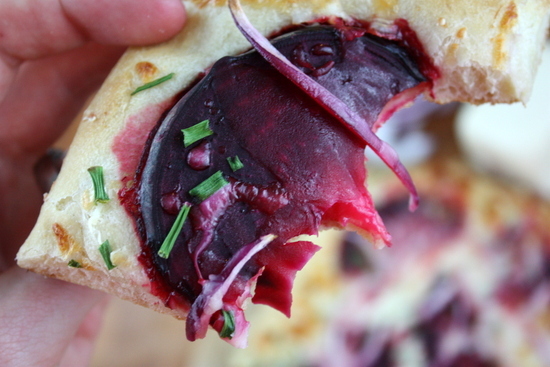 I can’t stop with the beets! Despite the fact that I am the only one in this household that enjoys them, I just can’t walk past them in the grocery store without picking them up. They’re so beautiful, and still a bit amazing to me. I’m thoroughly smitten with their dirty exterior, pink and staining insides, and long crunchy stalks. This is love! 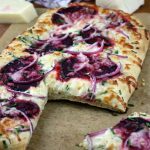 Let’s talk about flatbread. It isn’t pizza, because pizza has sauce, and more cheese. But it does resemble pizza… and tastes just as wonderful as pizza… We’ll call it a cousin to the ‘zza. Simple pizza dough. A sprinkling of mozzarella. 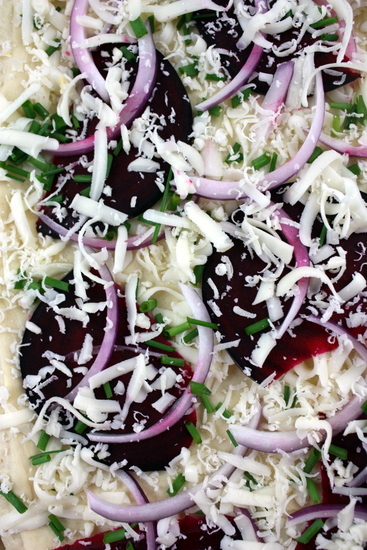 A layer of beets, a dusting of chives, and a scatter of onion slices. Perfection! Bake it up, slightly cooler than I bake my pizzas, and enjoy! I found myself eating this for lunch, on the side of my dinner — or as a late night snack! 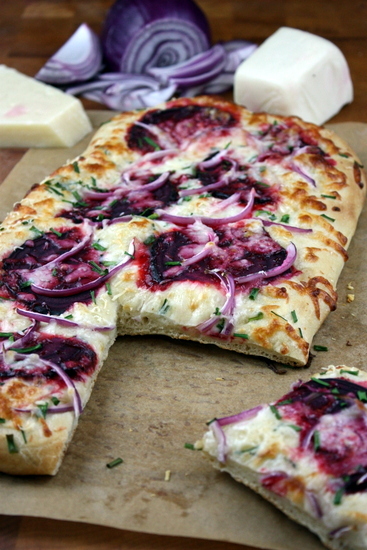 A quick, tasty, and healthy flatbread recipe for a weeknight or anytime! Prepare the pizza dough according to the recipe. When ready to bake, preheat the oven to 450 F.
Bake for 12-15 minutes, and enjoy!